Have you seen the iPad Mini? I wasn’t interested at first, but maybe I’m starting to become an Apple fan girl and now I want to have this mini. I have the first generation iPad but it’s mostly being used by the boyfriend. The iPhone5 interests me but I doubt I’d be able to afford it’s hefty price tag. Of course I’m willing to wait until my current contract with my telco expires in April to find out if the iPhone5 is offered to me at a considerable price, but I’m already thinking that getting the iPad mini is a more affordable alternative. The Wifi version is good enough for me, just like my first iPad. If I need cellular connection, my iPhone can provide that with no issues. This will be so handy, and won’t add to the weight of my already heavy leather bag. I can do pretty much anything I’d do on the regularly iPad, including watching hair styling videos if I need to. But it’ll take months before this baby is available locally so I’ll have lots of time to think it over. These would really make the perfect gift for booklovers, and students too! I do not take self-portraits, but that photo on the top is me taking one as soon as I received my Firmoo package. I was so excited and happy at my little package! And why not? I received this free pair of glasses just a few days after sending my order in. There is no expense at all for bloggers like me who would like to try the product. But do not fret, NEW customers also get to try a free pair, you just have to pay for shipping costs. All is explained here. But what do I think about my glasses? I love them! I’ve gone through so many pairs in my lifetime but I’ve so far only really loved two. The one I bought some time ago from Evita Peroni is a keeper. But this Firmoo pair I love even more. It’s perfect for driving from afternoon til sundown. It doesn’t make everything too dark. I have always had issues with my eyes and I get headaches all the time. Since childhood. This is probably why it’s never been easy to find a pair of sunglasses that were just right. And now to have two? Happiness. My Firmoo package came with a cleaning cloth and two carrying cases: a hard shell one and a nice smooth black pouch. The hard case is perfect for storage at home, while the pouch is what I’d use when I take it out with me. At first I was wary about ordering glasses online. Like shoes, I’ve always felt that it is better to try them on before making a purchase. How can you know if it looks good on you until it’s too late? Firmoo’s website has a feature that lets you virtually try on the glasses. You’ll have to do some measuring, then upload your photo, and you’re all set. I think that’s genius! So go, head on over to Firmoo.com and find the design that suits you! 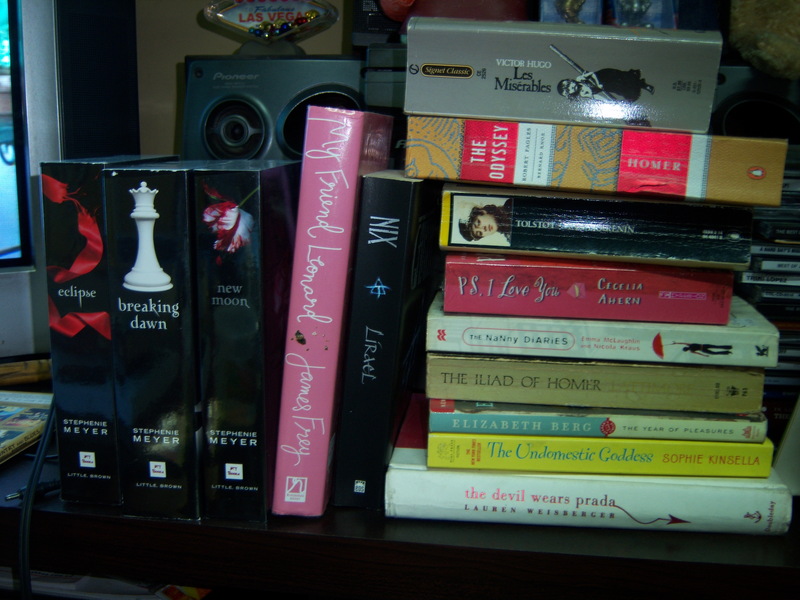 That pink, hard-bound version was a victim of Ondoy. The cover is similar to the that of A Million Little Pieces, only a different color. The writing style is also similar. Stream of thought. Not much regard to punctuation. No rules. He was controversial, his novels were controversial. I didn’t care then, I don’t care now. They are captivating. Not in the sense of being awed, but in the sense that you want to know what happens next. It is boring at times, but then whose life is exciting every minute of everyday? What happens to Leonard is still quite a shock. I didn’t see it coming. And truth be told, I felt myself choke up a little. I was almost moved to tears. Leonard was larger than life. Once he sobered up, he lived fully. He loved cigars, but none of those cheap bundle cigars, expensive ones. He taught James how to appreciate a good one. Leonard was a huge part of James’ recovery. Without his guidance, his friendship, it would have been more difficult for James to stay clean and sober. He was there. In a way, they took care of each other. I’d love a friend like Leonard, but I’d probably be scared too. Scared of having too much money, and wielding what may seem like too much power at times. Or being around one who had/did both. Anyway. I liked this sequel and I will probably get Frey’s third and fourth book. A good read too would be the transcript of the infamous Oprah show where she questioned the author about the true nature of the book. Then follow through with this interview five years later.